Food delivery and restaurant discovery firm Zomato is in final phase of talks to acquire Bangalore-based on demand service provider Dunzo as per the market rumors The deal size and financial details couldn’t be immediately ascertained. The development happens at a time when Zomato’s rival Swiggy has expanded its services from food to on-demand product delivery. Dunzo will give Zomato the much needed competitive advantage in this segment. Interestingly, Dunzo has also been in conversation with institutional investors to raise its next round of funding to the tune of $15-20 million in the last couple of months. Swiggy recently started operations of Swiggy Stores, which delivers household items like grocery, flowers and meat among other things within an hour in February. 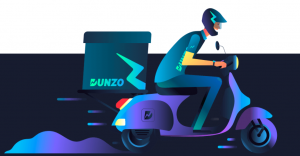 As per the reports it was noticed that Dunzo was also in talks with Swiggy for an acquisition. However, the deal couldn’t be finalized due to unknown reasons. That’s really called up selling and cross-selling model effectively. First they have master the art of hyper-local food deliveries in 30-60 min ETA category and create an inclusive customer base to an extent that now they start to deliver groceries, fruits and vegetables and enter into more spaces to leverage their expertise in last-mile and logistics. Zomato is in talks with dunzo for potential acquisition. On the lines of Swiggy Store, Zomato wants to get into hyper local delivery. However, does the deal make sense for Zomato? Dunzo was launched in 2015 by Kabeer Biswas, Mukund Jha, Ankur Aggarwal and Dalvir Suri. It was started on Whatsapp and has now grown to become an app available across Bengaluru, Pune, Hyderabad, Gurgaon and Delhi. The company delivers products from local stores and has also been running bike taxi services in Gurugram. In 2017, Google came on board with an investment of $12.3 million. This was also Google’s first direct investment in an Indian startup. Recently, it also raised Rs 3 crore from MakeMyTrip founder Deep Kalra. Can’t Zomato build such capabilities rather than acquiring dunzo in tune of $45-50 Mn (at least)? Build v/s buy dichotomy for Zomato. Build v/s buy dichotomy for Zomato. Founded by Deepinder Goyal in 2008, Zomato is currently present across 24 countries. It claims to be serving 65 million users every month across services such as restaurant reviews, restaurant discovery, food delivery and dining out transactions. It last announced the acquisition of TechEagle Innovations to work on drone-based deliveries in India. In 2017, it also acquired Nexus venture-backed last mile delivery firm Runnr.